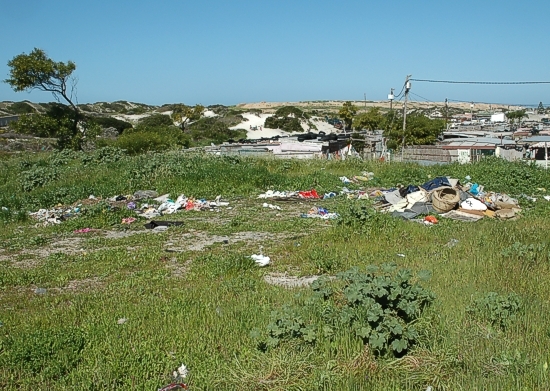 the Zandvlei Trust, various other voluntary NPO's and the City of Cape Town. The World Design Capital 2014. What and where is Village Heights Community Centre. It is a registered NPO. 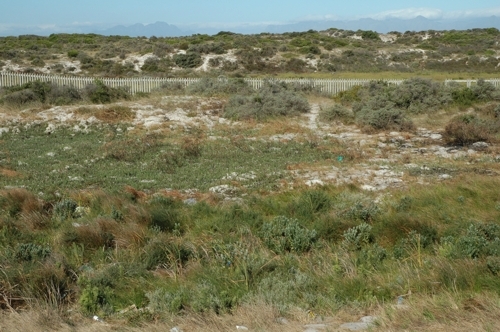 Situated in the Lavender Hill area at the end of Military Road and close to the Rondevlei Nature Reserve western border. also individuals to help further our aim. 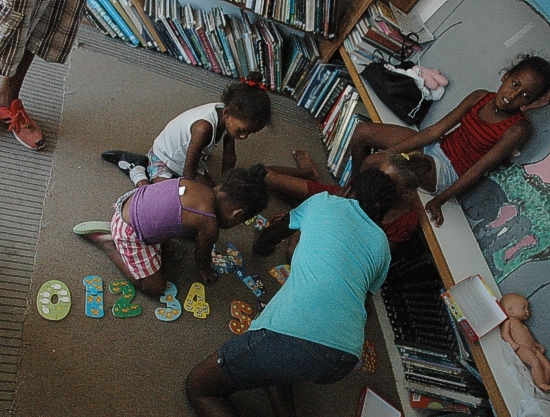 a Community Library with surfing for different age groups. 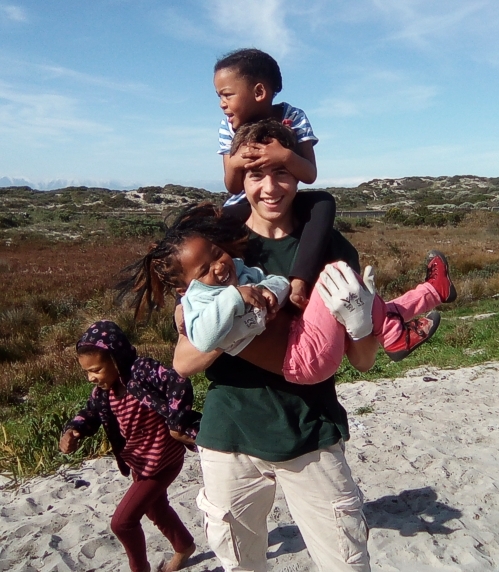 Gavin Lawson is a volunteer Zandvlei Trust member, training and advising the administration of the VHCC organisation as a ZVT project together with the above people and others. Contact Gavin Lawson. or 021 705 5224. Some of the Organisations we have working partnerships with. 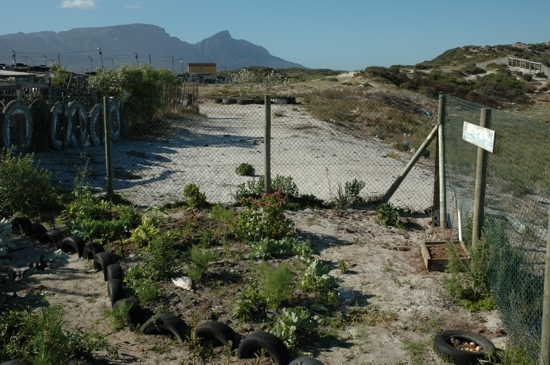 The Village Heights Community Nature Garden. 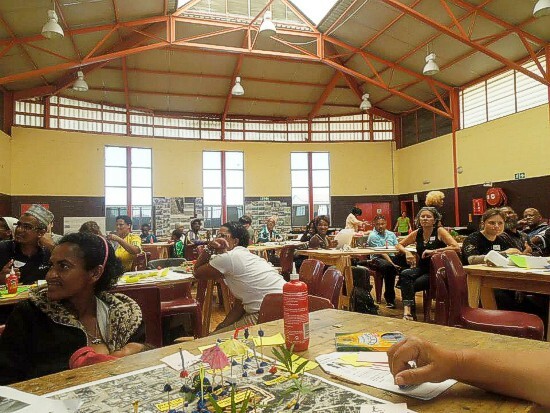 exciting project by the City of Cape Town and a number of other role players. Click on the photo below for the link. displayed in the library at Village Heights. 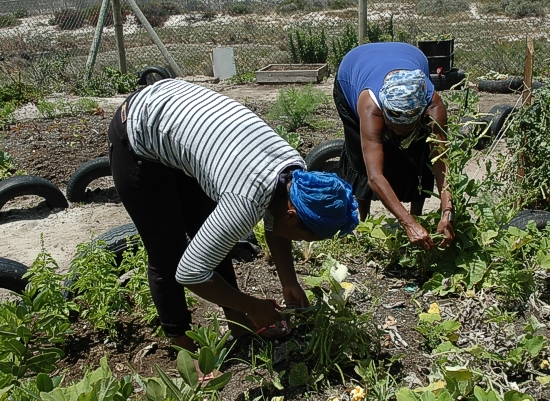 Loubie Rusch makes lekker tasting food / kos from indigenous plants that grow all around us. A variety of species will be grown in a Seed Library Garden which will be planted in the Nature Garden. 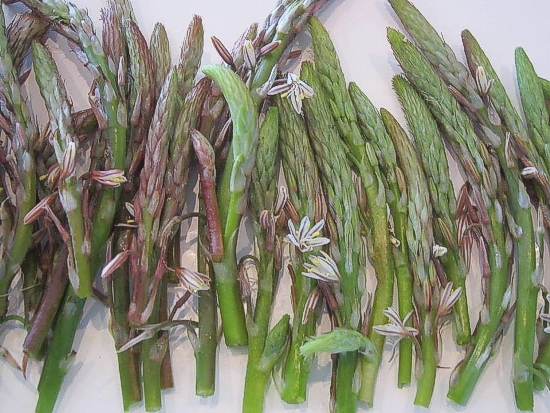 Wild Asparagus (veldkool) delicious raw or cooked. See Loubie's very interesting FB page here. "Look what I did today." See more ..... updated 02/09/2016. 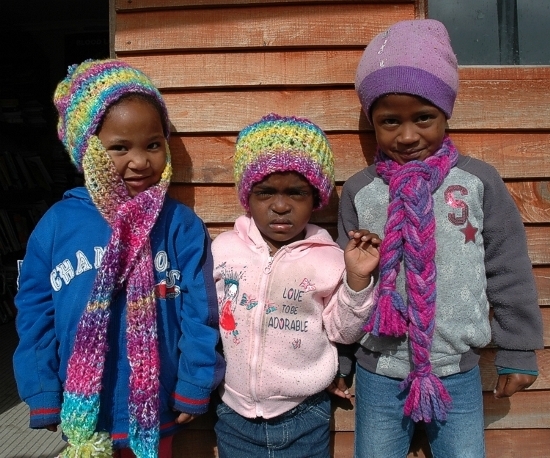 Baby booty and cap sets are the latest addition to the variety of hand knitted items for sale. 26/08/2016 - The flowers are blooming at Village Heights. Looking across the wetland from the Rondevlei Nature Reserve fence line. 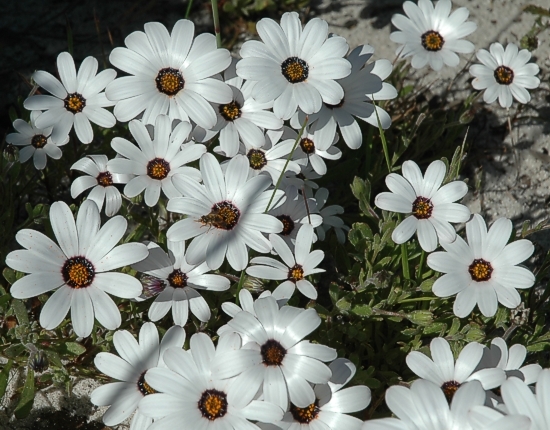 There are carpets of spring flowers to be seen. 26/08/2016 - We had the 3rd Upcycling Waste Workshop with Amy today. Washing the bottles before starting to work with them. See more ..... updated 31/08/2016. 25/08/2016 - Today was warm and sunny with no wind after early morning fog over the whole Peninsula. Busy as usual. 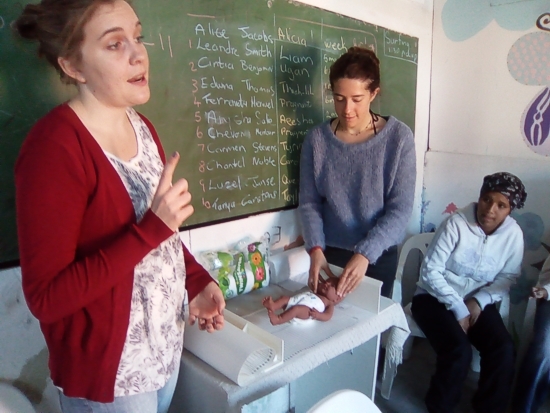 Tuesday the Projects Abroad Nutrition Workshop continued with fewer mothers as many were at doctors clinics and hospitals. Wednesday the Knitting Class continued with Joan and we had a new lady today. 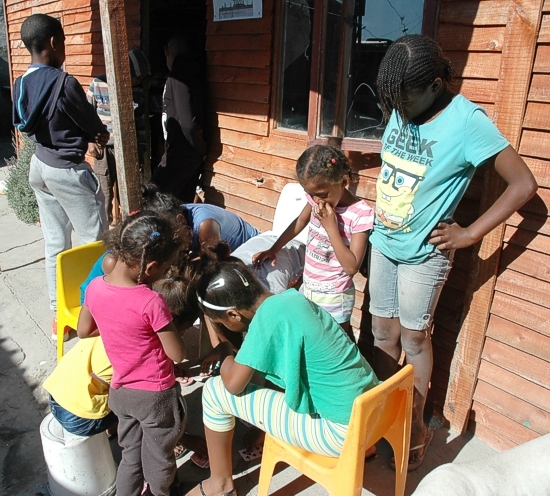 Also Youth with a Mission came to help the children with homework and played games in the play park with them. 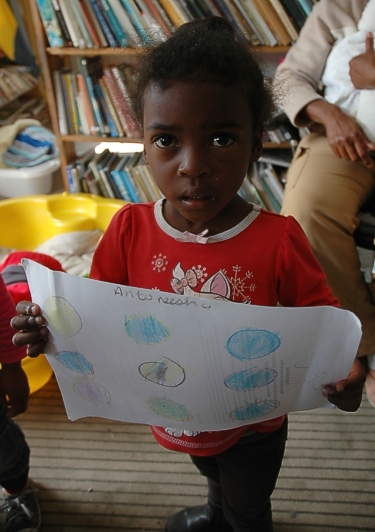 The children were busy in the afternoons with homework in the library. Last Friday the Eco Buddies were making a mannequin from upcycled waste to display the knitting on when the knitters go to the craft market. yesterday, look what she has produced today!! 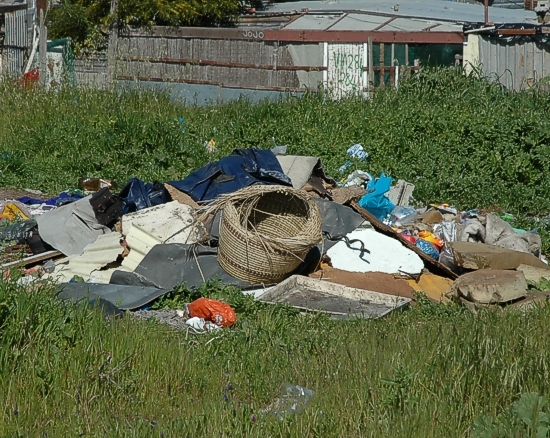 Dumping which took place over night. 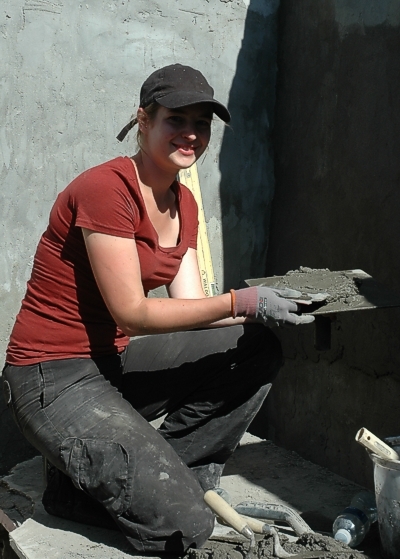 Projects Abroad volunteer plastering the walls. See more ..... updated 30/08/2016. Hard at work in the library doing homework. See more .... updated 30/08/2016. 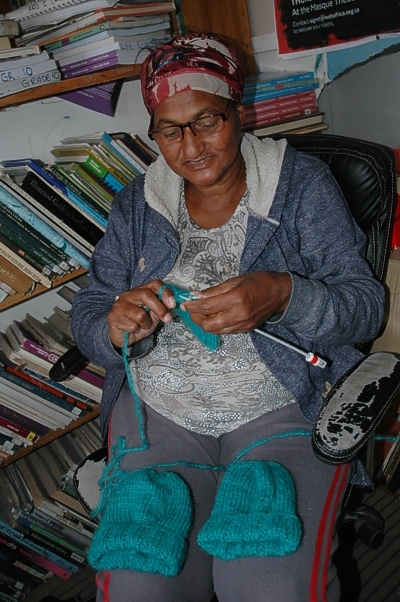 18/08/2016 - Today we continued wit knitting in between all the other activities on the go. 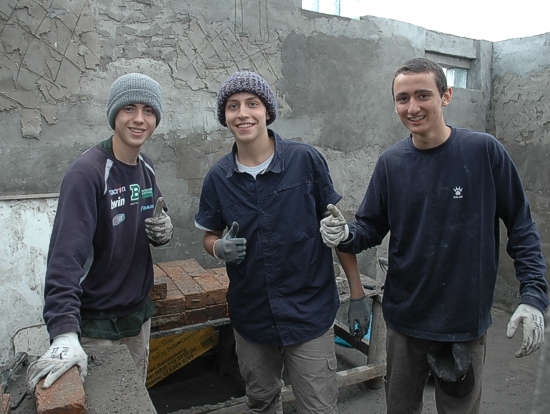 bricks and relaying some pipe work. Veronica with 2 baby caps she made in yesterdays knitting class. 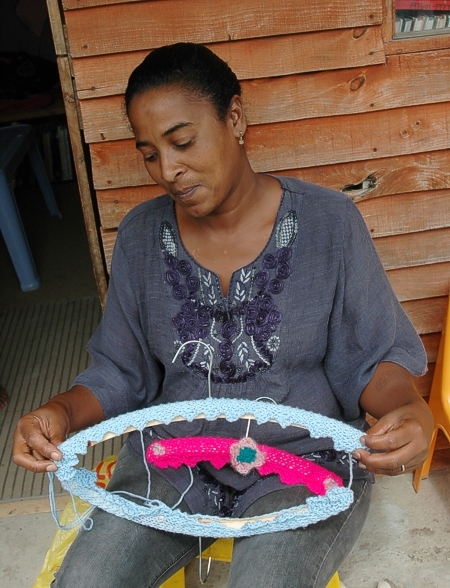 She is busy making a scarf in this photo. 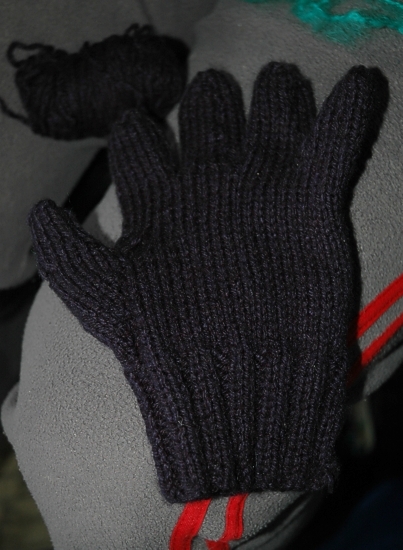 We are knitting gloves now. 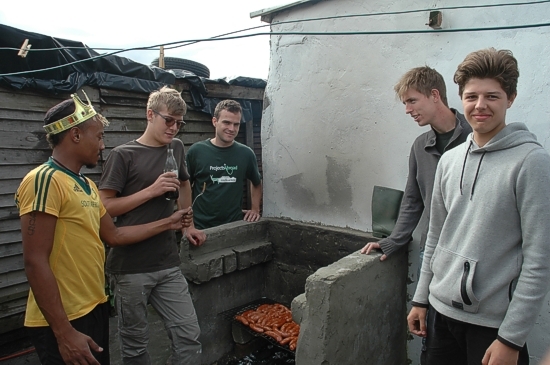 Two new volunteers have arrived from Germany. a lot of new information. research in the library and on the internet and find out how to go about making and playing a flute. They even found out one can make a flute from a carrot!!! 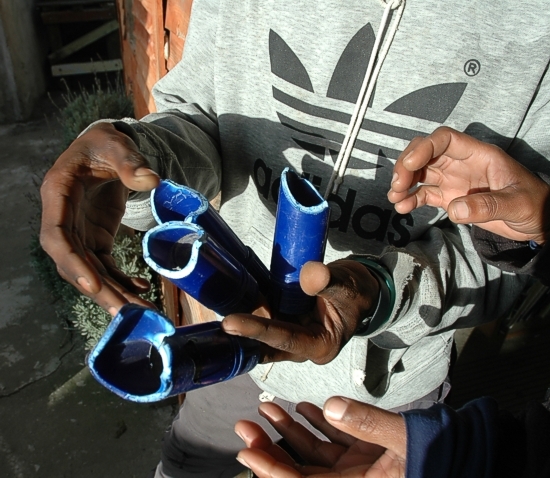 The Eco Buddies making different kinds of flutes from some discarded plastic pipe. See more ..... updated 25/08/2016. The footprints of the babies were taken today to stick into their workshop books. 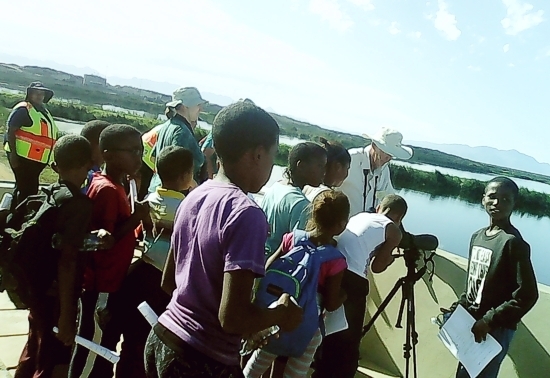 funded by the Table Mountain Fund (TMF) as a ZVT project. The Eco Buddy Club were involved today. Here is some of our group today after we finished making a "sample tree". See what we did .... updated 30/08/2016. waiting for the Projects Abroad Surfing taxi to fetch them. Some deft foot skills being show there. .... and suddenly the ball was dancing off under another pair of feet going in circles. Our group today at the end of the Workshop. 04/08/2016 - The volunteers were still arriving and others leaving. 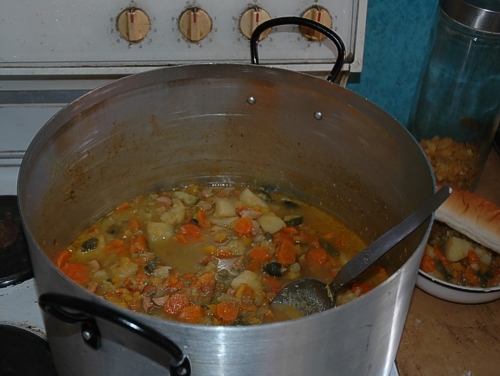 It rained hard again on Tuesday so the Nutrition Workshop was cancelled. Wednesday was a public holiday for the municipal voting elections, so there was no knitting class. There is enough stock to go to the Marina Craft market this Saturday. 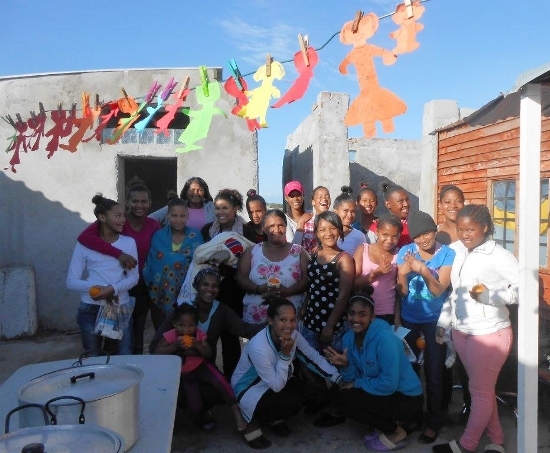 We also have a Dignity Campaign Workshop on Saturday afternoon for the ladies. 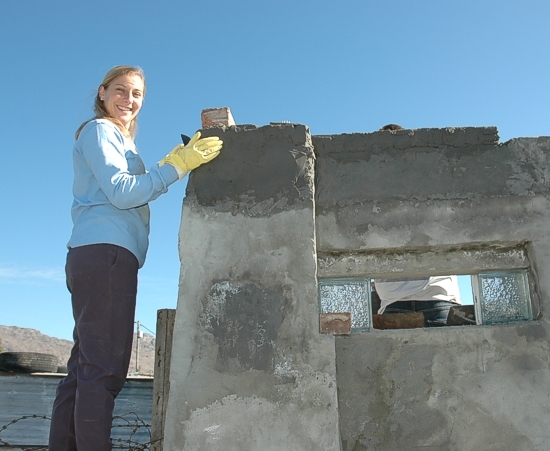 mixing cement for the wall being built behind them. 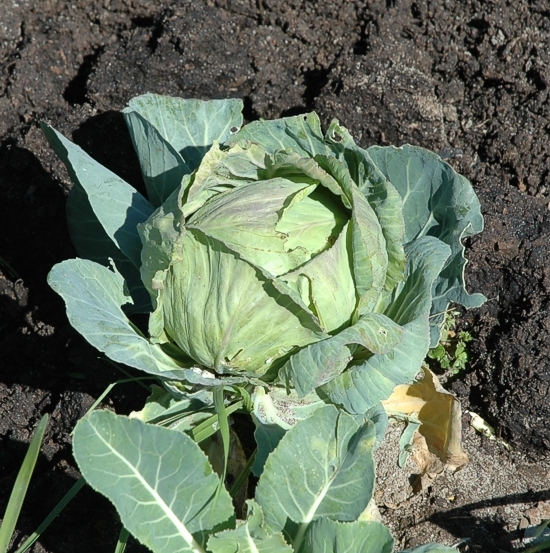 The cabbages growing very well in the vege garden. 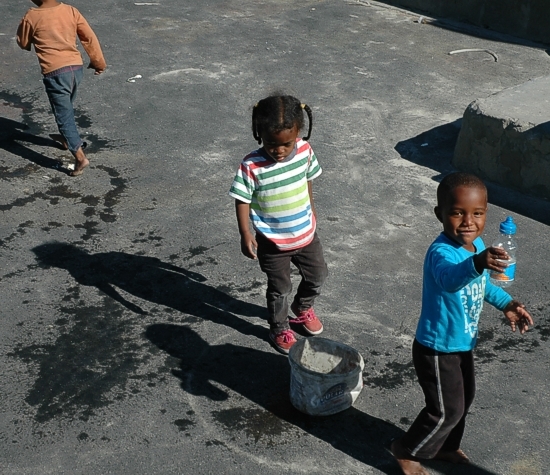 The young children having fun with a squirt bottle filled with water. "Look its empty ..... I must fill it again." "magic fairies" will remove it in time. "It creates employment" they say. 31/07/2016 - The Monthly Report for July by the Chairman. updated 13/08/2016. 28/07/2016 - Wow what a storm we had on Tuesday all day and night. Spent Wednesday clearing up the water paddles. 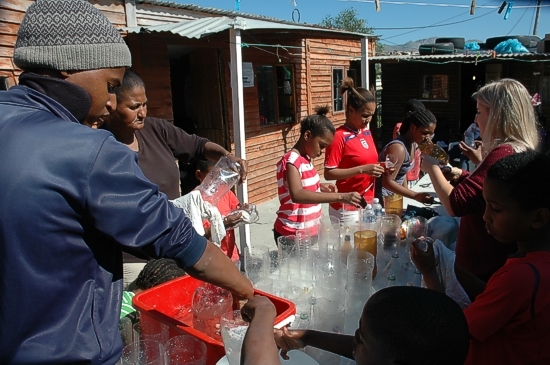 The Nutrition Workshop had to be cancelled because the creche building was flooded. 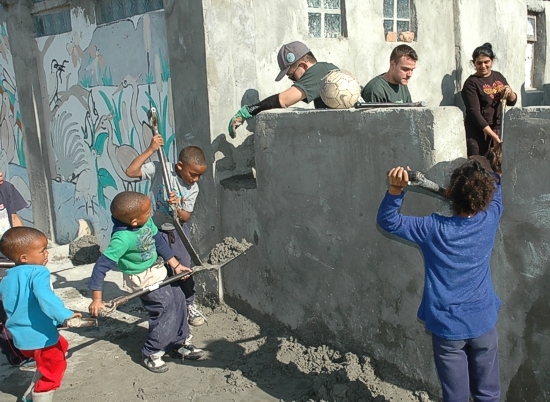 5 Projects Abroad volunteers were leaving us today. 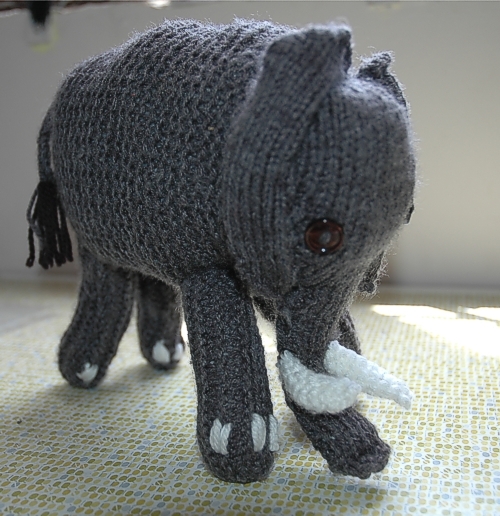 The knitting is progressing with some new items. 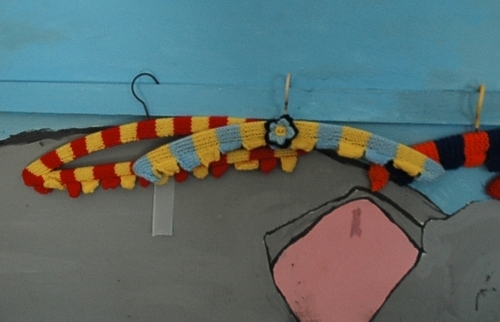 These are the bright colourful caps and scarves that Berny and Veronica have been making. 21/07/2016 - This week the children went back to school. And it was still very busy at VHCC. today donated by Patty Hardy. See what was happening .... updated 29/07/2016. 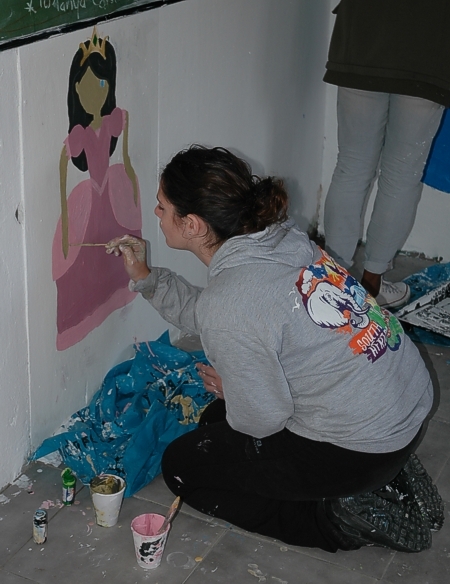 A Princess from a story being painted on the wall in the creche by the Projects Abroad volunteers. On another wall in the creche the continent of Africa in the spotlight. It is having some details filled in. The boys cooking the lunch for all. 14/07/2016 - The Projects Abroad volunteer team building a wall today. The little ones also wanted to help build!! Seen shovelling the cement over the wall to the builders. 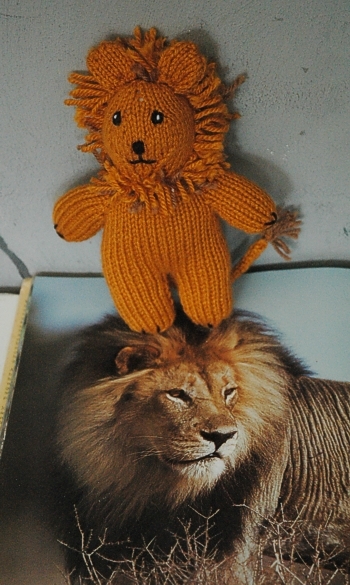 14/07/2016 - Veronica is busy knitting more lions. 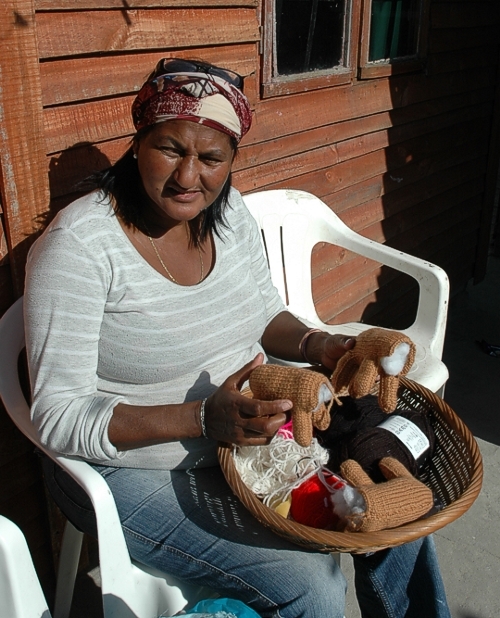 Veronica with her knitting basket. various countries they come from. 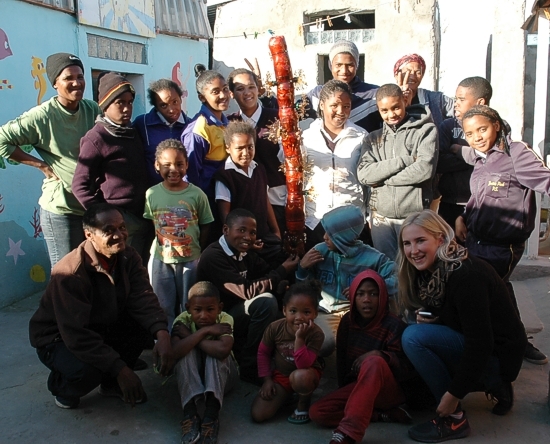 They are coming back to VHCC for a celebration braai this evening. 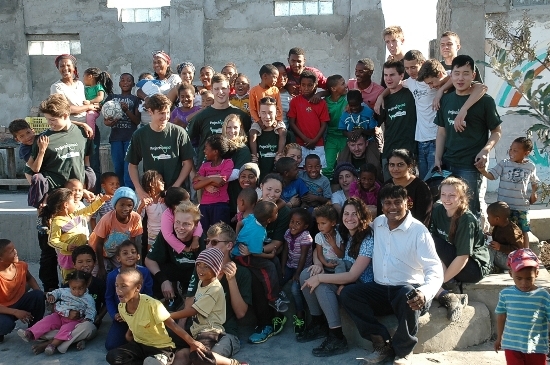 A Projects Abroad volunteers group photo with the children in the playpark. with her assitant demonstrating how a baby is measured using a plastic doll. 12/07/2016 - The Projects Abroad volunteers playing with the children and they were given lunch too. 07/07/2016 - To day was a busy day at VHCC!!! Plenty of activity on the go today. 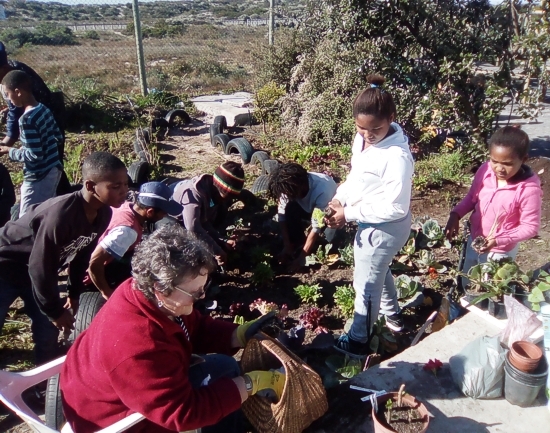 A vegetable garden workshop conducted by Melanie Stewart from Botsoc. 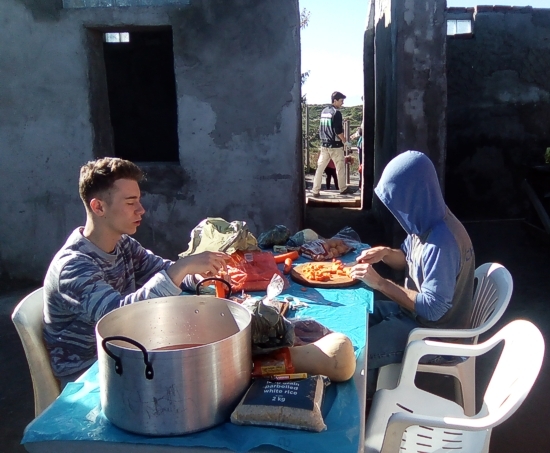 Projects Abroad building, preparing food to be cooked for all and playing with the children, also a small bus load of visitors from the Projects Abroad office. An upcycling activity which Berny was conducting to make leaves for the "upcycled tree". Books arrived for the library. 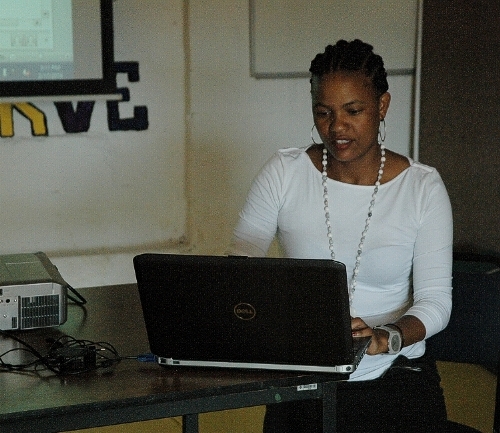 There were applicants going through documentation requiremments for job and skills training to be submitted. Also VHCC admin activities were on the go. Melanie Stewart conducting a vegetable garden workshop. 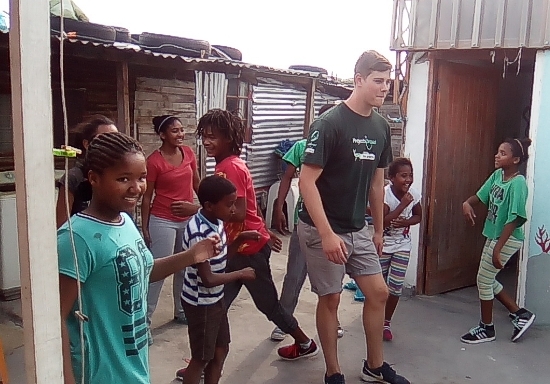 The Projects Abroad volunteers having fun with the kids. 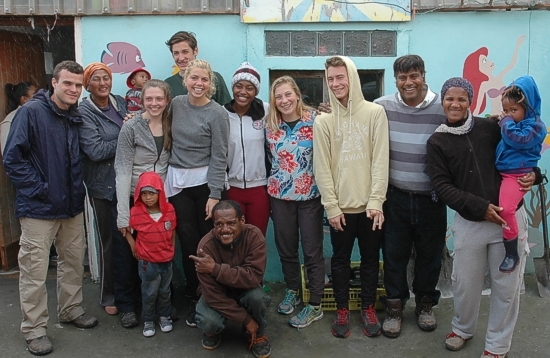 Projects Abroad volunteers making food for everyone at VHCC today. 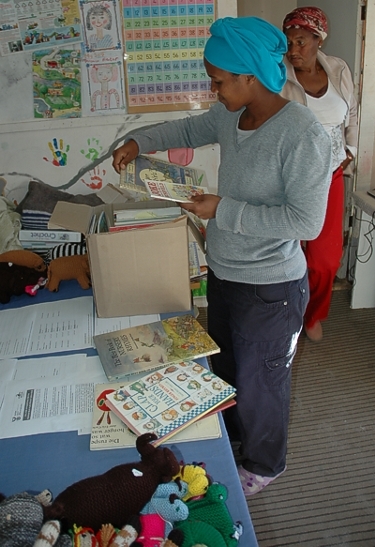 Berny going through a box of childrens books donated by Patty Hardy. 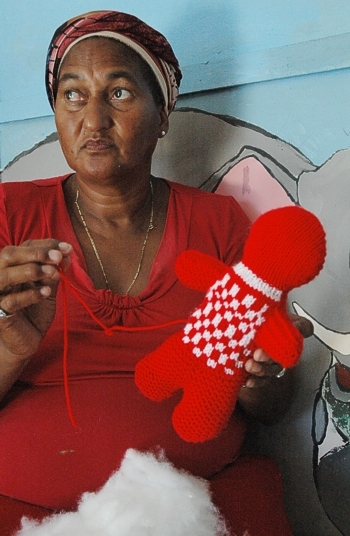 Catherine came all the way from Camps Bay to support the knitting group. 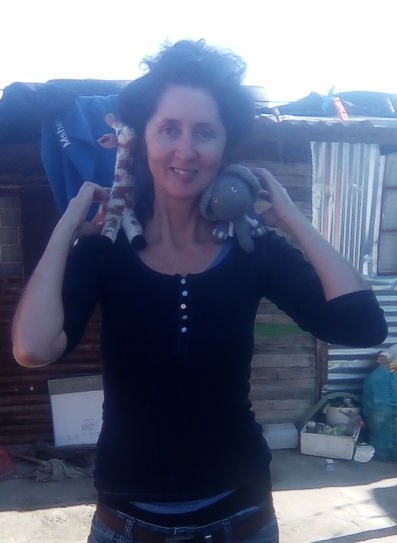 She is taking a giraffe and and elephant home. 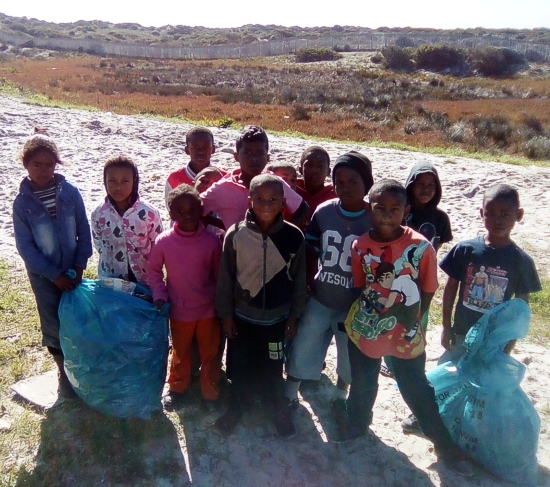 These children have filled these 2 bags with litter removed from the wetland and surrounding area. What are they going to be doing with the contents? 30/06/2016 - The Monthly Report for June by the Chairman. was sponsored by the National Lotto Fund. Ciao! Buon giorno! The Italian Boys are in town. fun and games too. 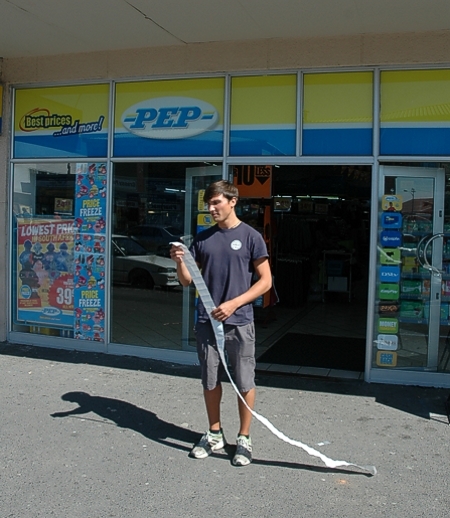 They were learning Afrikaans sayings and Berny was learning Italian sayings. 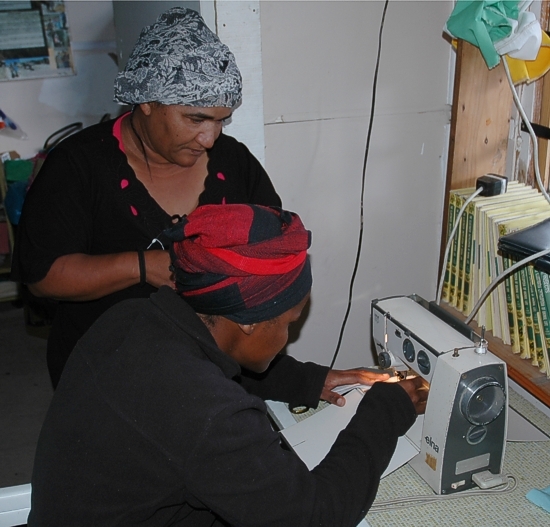 Julie and Berny testing at the sewing machine. Julie is making epiletes for her childrens uniforms. 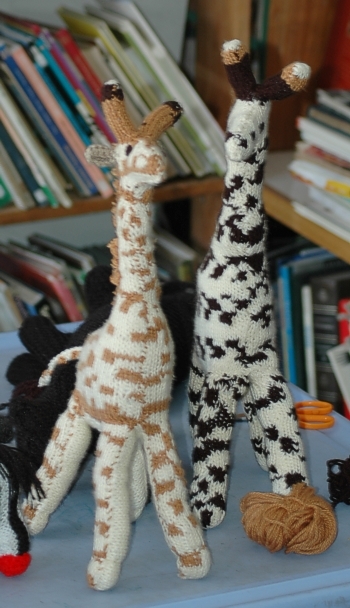 The giraffes are multiplying at VHCC, "a good conservation programme is being developed here." 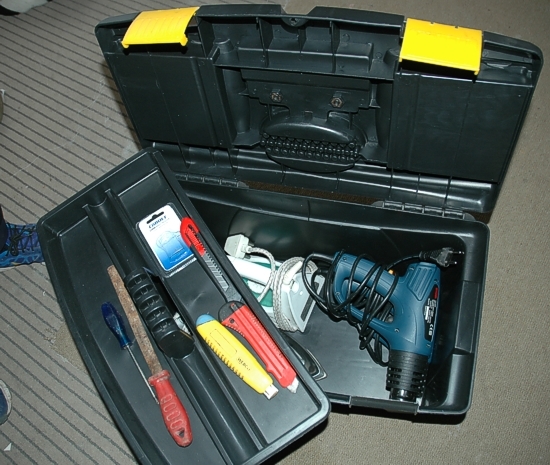 The toolbox for the Upcycling Waste Workshop and some of the tools we will be using. brittle for this job. They have shattered on impact from a soccer ball kicked and hitting the posts. Where to find replacements? They should possibly be made from polypropolyene, which is flexible. 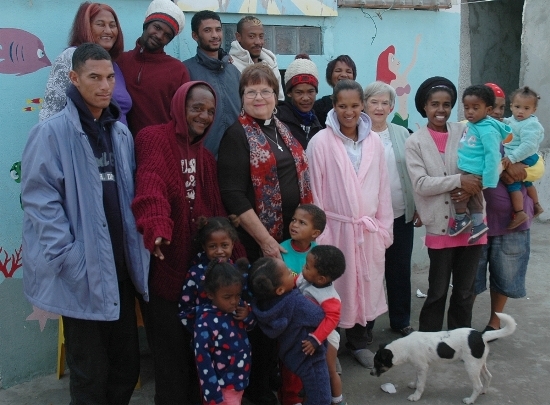 the Village Heights area run by Deborah Talbot from Projects Abroad. This is an Early Child Development Project. Deborah introducing herself and her assistant to the class today. compost and installed irrigation piping to reach a far section of the garden. 29/06/2016 - Projects Abroad - Cyris is leaving us today to go back to Australia. He has been coming to work at VHCC for 3 months. Cyris standing with his legs crossed listening to Deen thanking him for the wonderful time spent at VHCC. of the local boys from VH have come to say goodbye to him too. 28/06/2016 - The Dignity Campaign came to visit VHCC today. 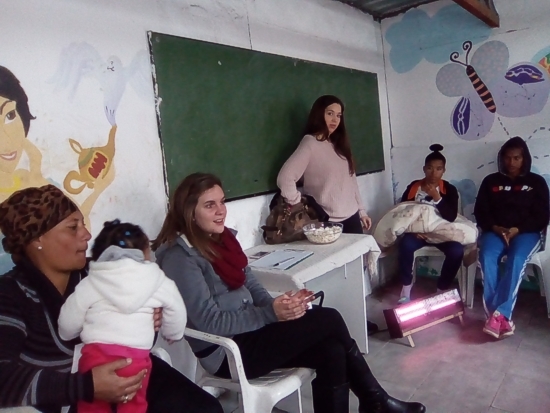 Meagan Ruiters came to visit and introduce herself and the campaign to the ladies to explore the subject requirement in the VH area. There is definetly a requirement and we will start some workshops soon. 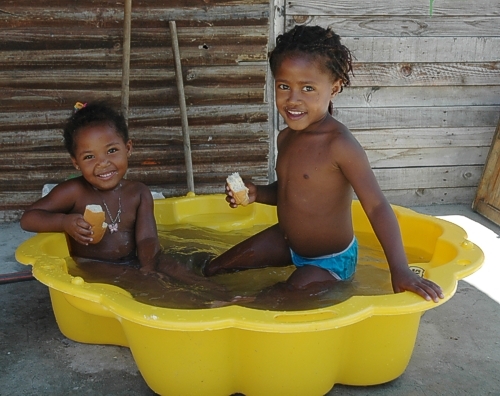 Help by sponsoring a Dignity Day. See the website above. 23/06/2016 - "J.A.M porridge goes down a treat". "Die pap sjmaak lekker!" they say. and delivered by Projects Abroad. 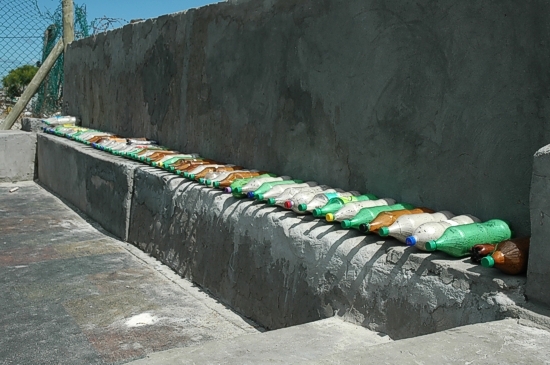 They are also waiting with a container or packet to receive a large helping of the fortified porridge. 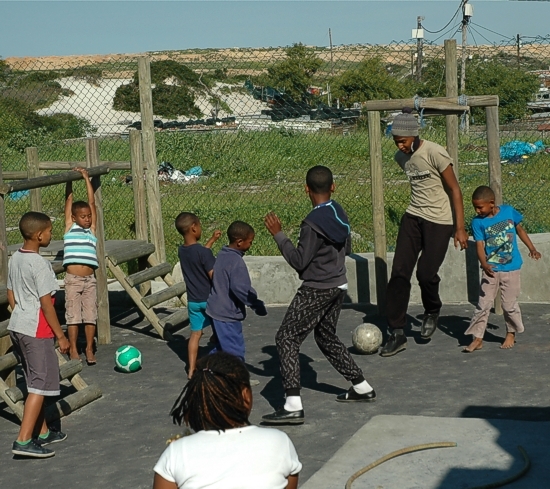 17/06/2016 - VHCC has signed a Charter with a number of role players in the Village Heights area. 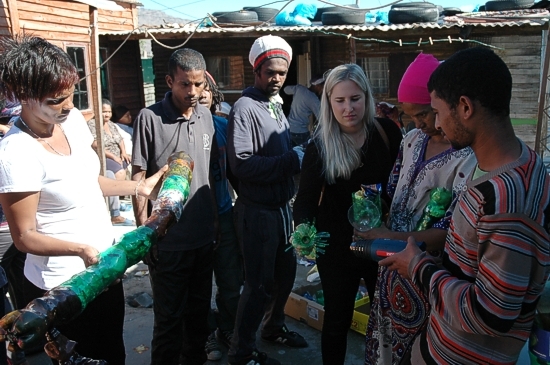 Nicola Rule from the City of Cape Town, Major Programmes and Projects Assistant, Environmental Resource Management Department, co-ordinated the process at the Seawinds Community Centre and concluded the process by distributing the minutes of the meeting and a photo record of the Charter. Each of the signatories have received a framed and signed copy for their records and reference. 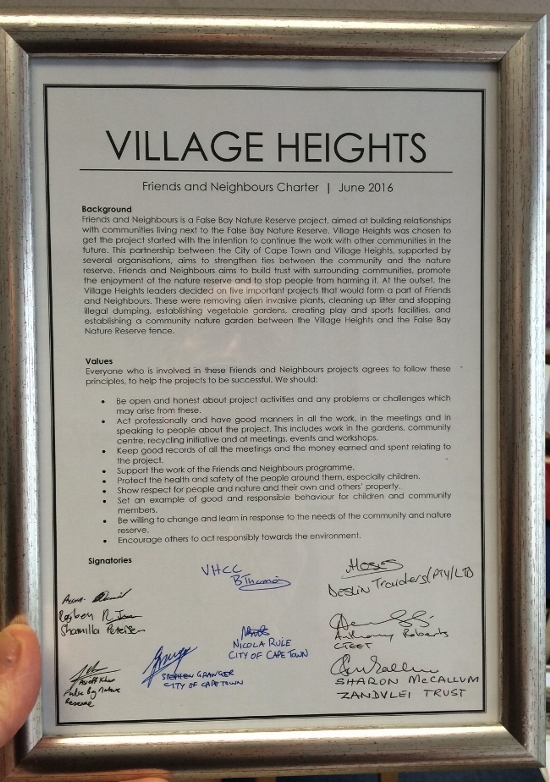 The signed Village Heights Charter. 09/06/2016 - The knitting group were busy and Joan had made a very pretty sample cap. 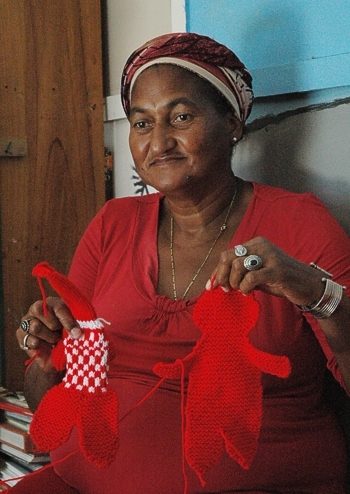 Veronica was busy producing some for sale at the Market. 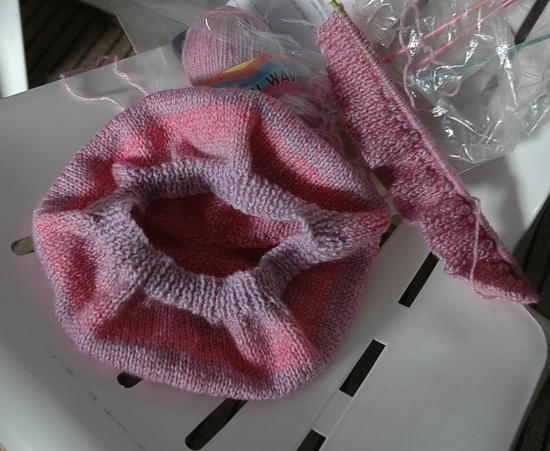 The second cap being knitted by Veronica. What beautiful colours! Also on the go was the repair an addition to the upcycled waste tree experiment. A hot gun was borrowed and available for the afternoon. So a group got stuck into modifying and repairing the tre stem. It was relocated to another part of the vegetable garden out of the way. The test is to see how it endures the winter elements until Amy returns for the next Workshops in August. 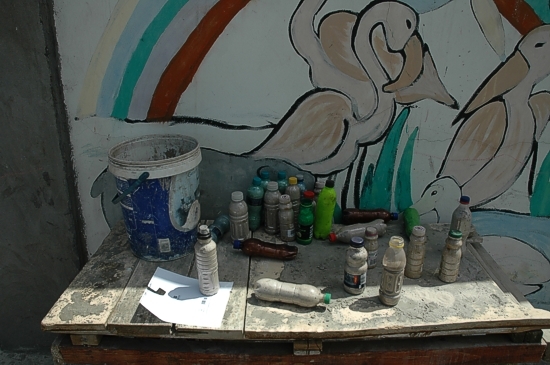 Some of the plastic material picked up in the Village Heights wetland and stored to modify the tree. 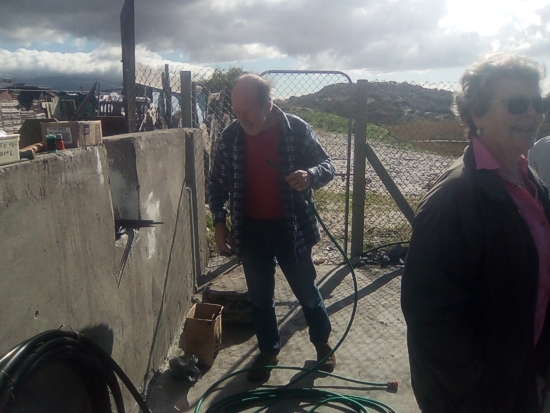 water quality and the condition of our catchment systems to the City of Cape Town. VHCC was there too. Ismaail, Gellil and Levi took part this year and had a wonderful time. Ismaail, Levi and Gellil at the start just after 07h30 paddling at Zandvlei. Behind them is the Thesens Bridge near the estuary mouth. 31/05/2016 - The May Monthly Report by the Chairman. is no photo documentery update available. That does not mean plenty of things did happened during this time. for the first time to find out where and what happens here. 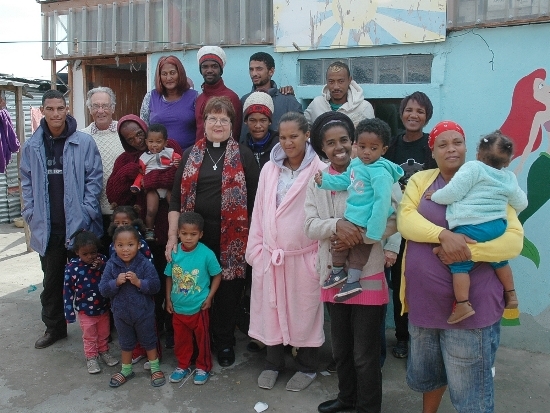 Some of the warm winter jackets being worn for the photograph with Rev.Tyers in the centre. Gerrard is on the left with the white top. Joan is hiding away behind Edwina. 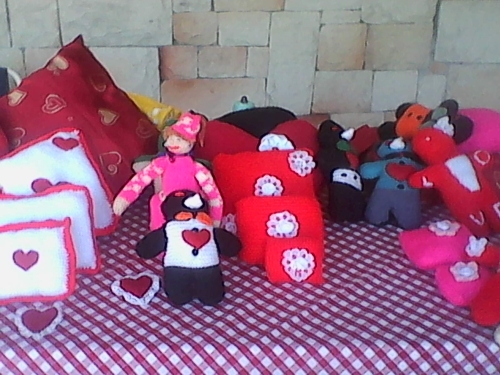 07/05/2016 - Marina da Gama Craft Market today. 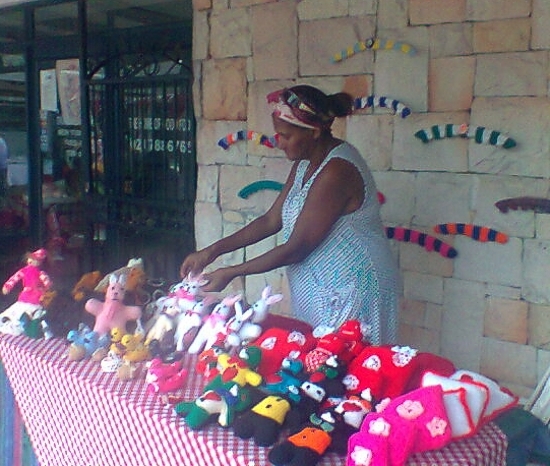 their hand knitted items for sale. 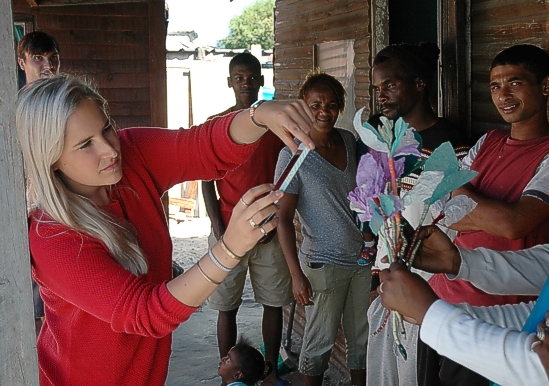 06/05/2016 - After school today the young girls wanted to make flowers for Mothers Day. So Berny and Veronica showed them what they had learnt in Amy Rusch's workshops. catching the flower in its vase on the right. would not have school classes today. A note was sent with each school child to this effect. So the play park and the library was full of activity. 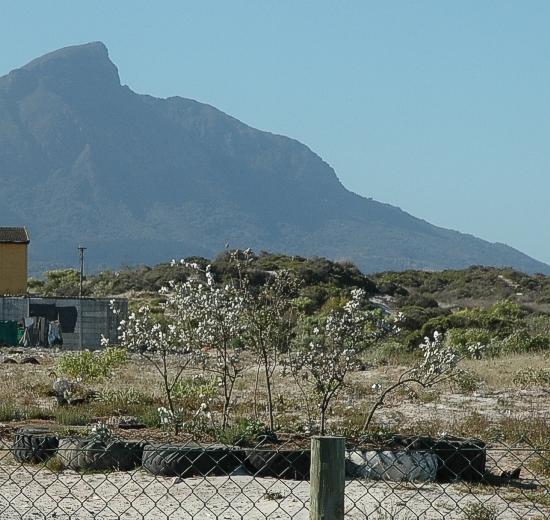 Table Mountain Fund (TMF) as a ZVT project which will take place over the next few months. make for the "tree project". Lets see what they can do!! Making parts of "the tree. What tree?". 30/04/2016 - The April Monthly Report by the Chairman. CTEET and Projects Abroad paid for the transport costs to get 25 of us there and back. 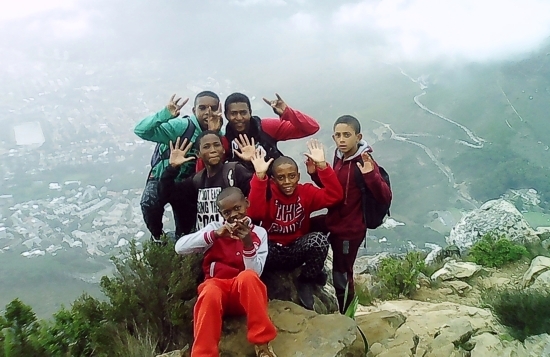 On top of the world with Cape Town way below. a visit to VHCC for an update on activities here. 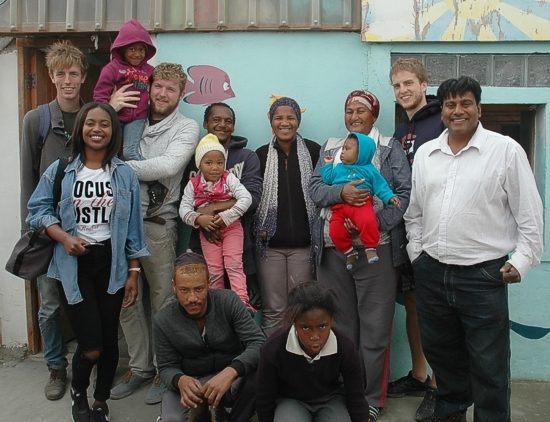 The Projects Abroad team Wynberg office visiting VHCC. 21/04/2016 - Take a closer look at what is growing in the back garden of a house in VH. it is obviously very well tendered. Just shows what can be done. 20/04/2016 - Visitors to VHCC today. 19/04/2016 - The tyre forest has been vandalised! Someone in the community cut the big branches off. Possibly to sell for firewood!! The children helping to plant some pruned branches from the VHCC vegegarden trees. 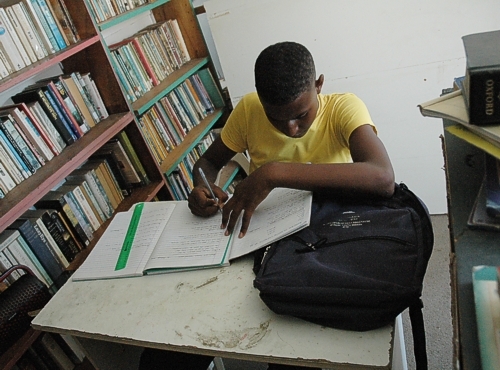 18/04/2016 - The VH children using the library to do their school homework. The little ones watching the older boys doing their homework in the library. group to the event. 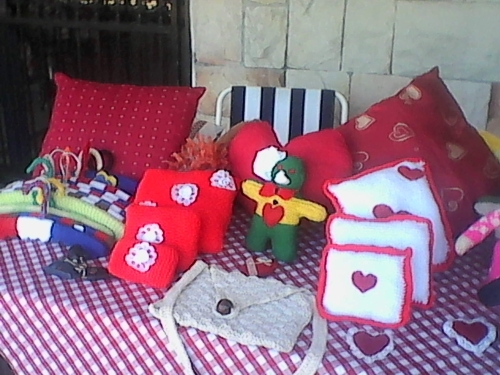 The knitting group had been allocated a table to display and sell their knitting items. photograph supplied by Bernadine Thomas. 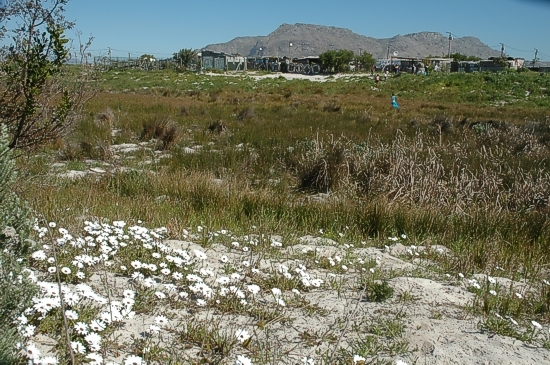 Centre in the Southern Birding Area of the False Bay Nature Reserve. 14/04/2016 - Lots going on as usual at VHCC this week. 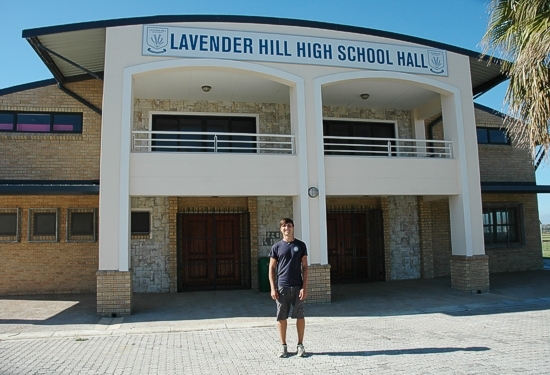 .......and what is Jan doing outside the Lavender Hill High School Hall? at VHCC today. Thank you team. The level has gone down quickly. Got to leave some for the others arriving a little later. 31/03/2016 - The March Monthly Report by the Chairman. 31/03/2016 - This week has been busy. 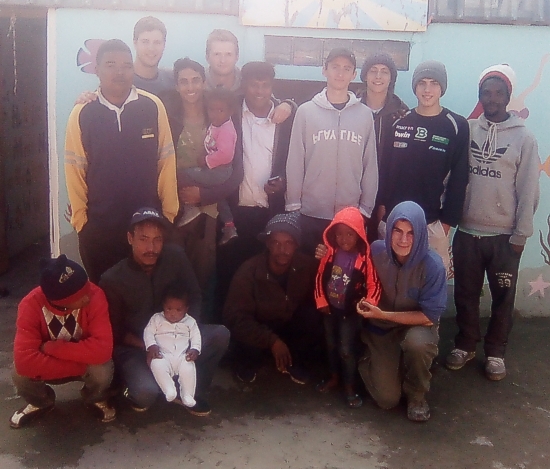 Pride of Table Mountain walk with Sharon on Saturday, a soccer derby on Easter Monday, some nearby houses burnt down on Tuesday and all were helping there. 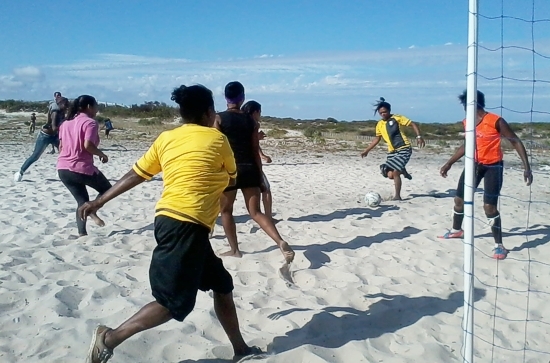 And it is still school holidays with all the children who are very active. 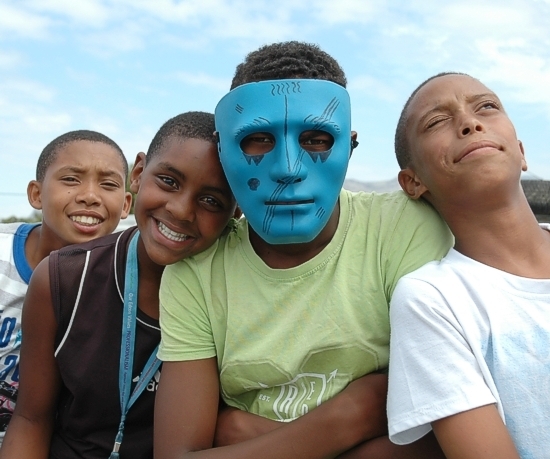 These animals are going to a movie tonight in Muizenberg at the Masque Theatre! 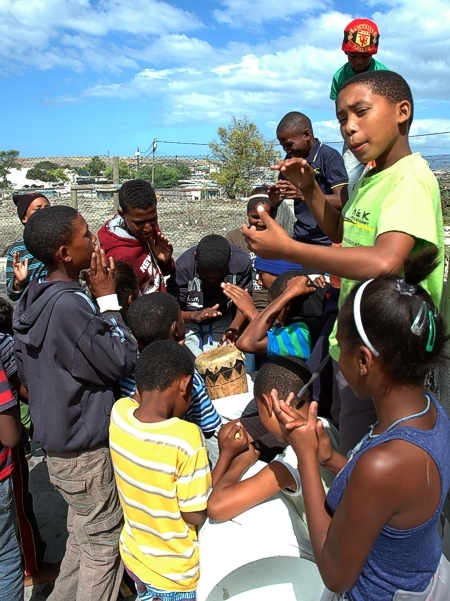 The kids were having some fun with their druming session in the playpark. with dozens of hands banging out the rhythm. And some whistling too. 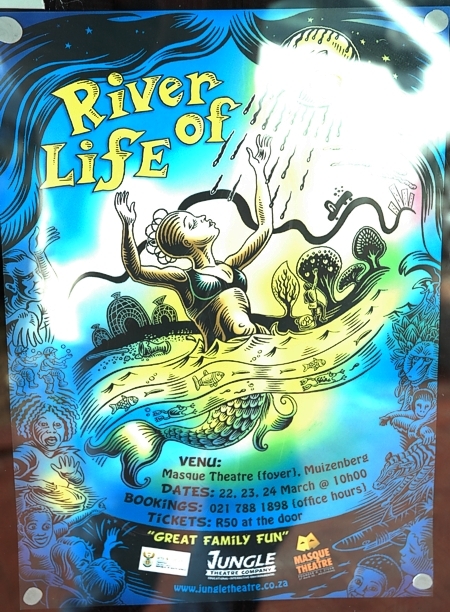 by the Jungle Theatre Company called the River of Life. The poster advertising the play at the Masque Theatre, Muizenberg. visitors and he took these photos. The VH Street Swingers team in orange tops and VH New Age team in the yellow tops. 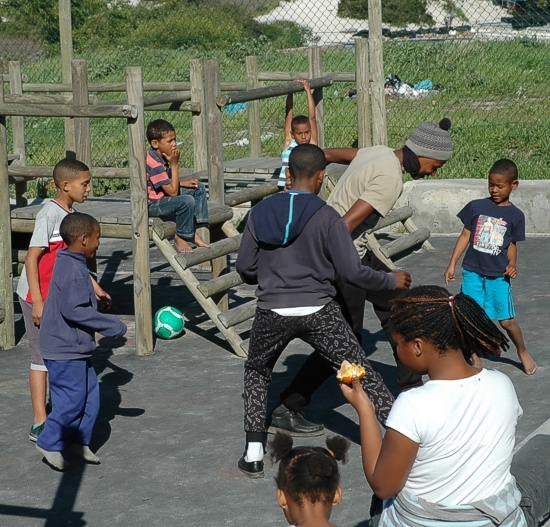 17/03/2016 - The school holidays are about to start and the playpark is busy. 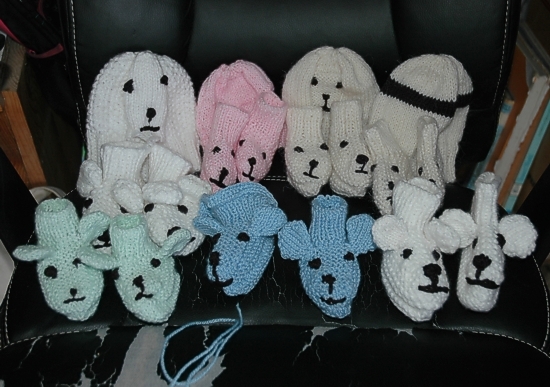 Ziema started knitting this week and made these coat hanger covers. 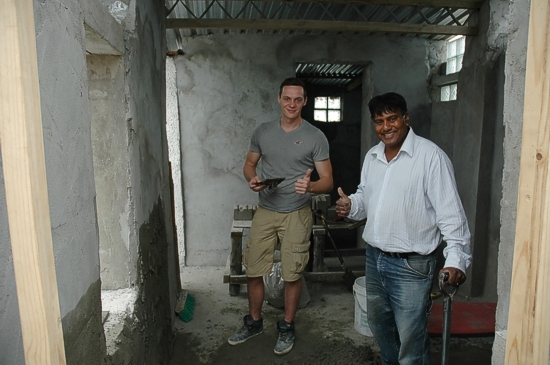 Deen and his Projects Abroad team members are building. It is school holidays tomorrow and the boys are already having some fun. 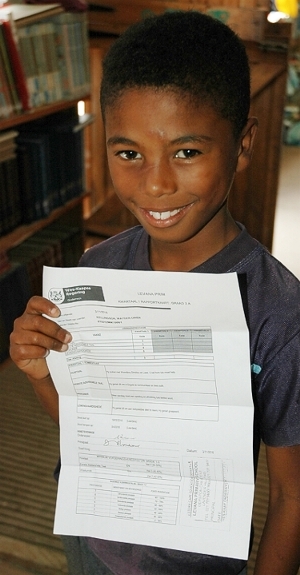 Wayden holding his school report, he did very well this term. 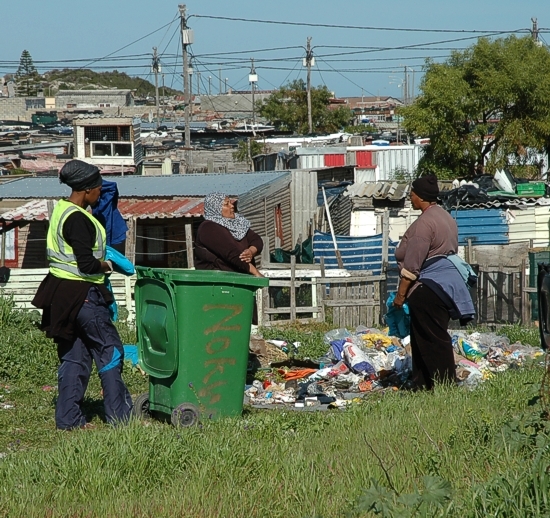 10/03/2016 - There were very unpleasant shootings between the gangs fighting in the area last week. This week all is quiet cross fingers. plans he has to help some of the children at Village Heights. some photos of recent activities at VHCC. 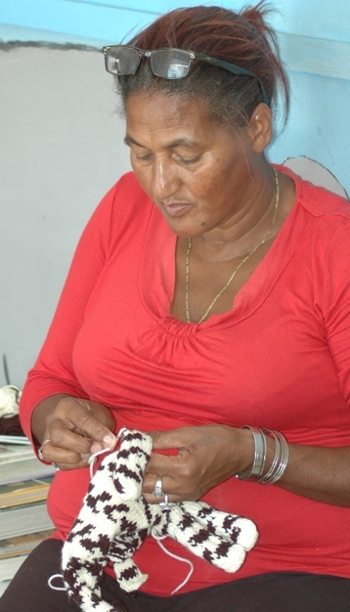 Veronica working on a Zebra. They were busy yesterday making handbags too. 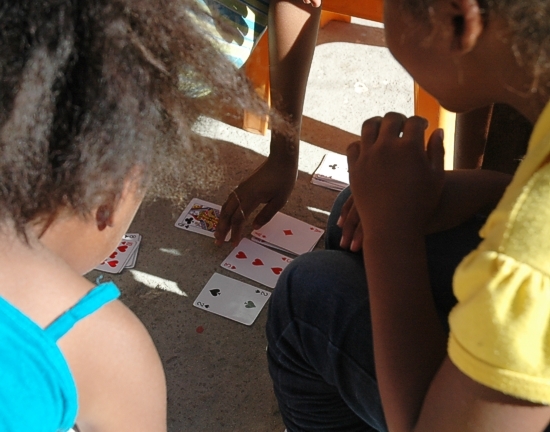 There are a few small children coming to the Centre, so the Gift of Hope is running again. 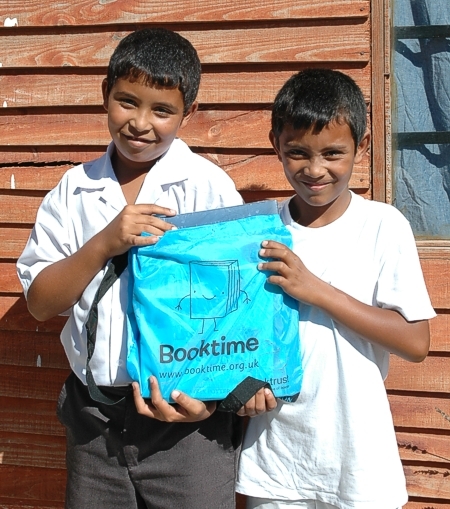 These brothers enjoy reading books and come to the library regularly. So Bernie decided to give them this pack of beautiful books. 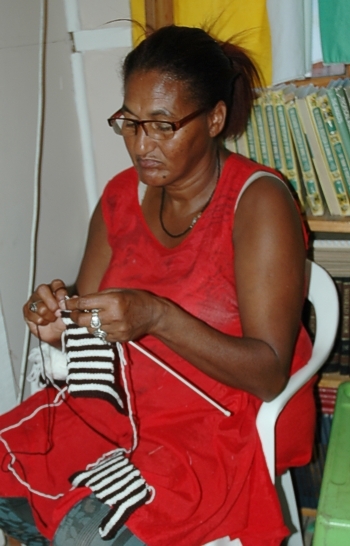 09/03/2016 - On Wednesday the sewing and knitting group continued. 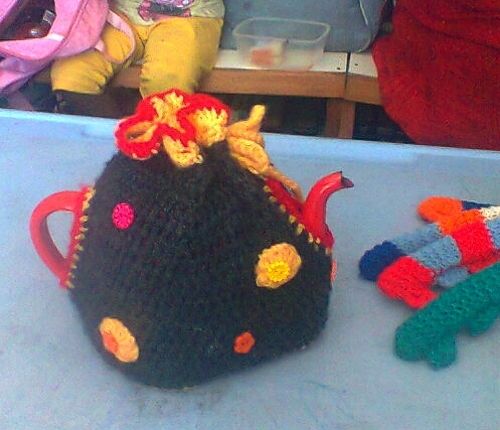 A teapot cosy which has some orders attached. "Can we or cant we? Of course we can!!" 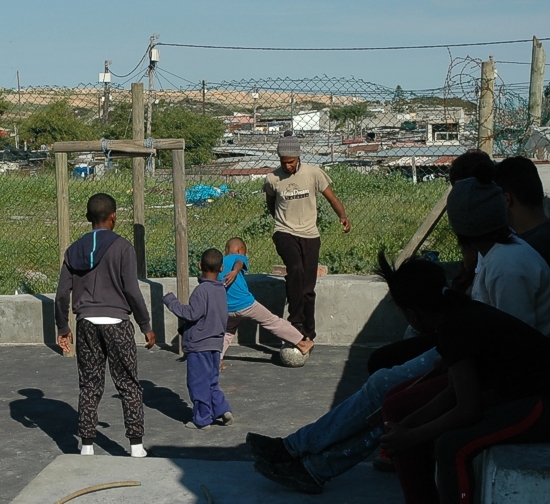 06/03/2016 - Sunday afternoon Soccer at Village Heights. Senior Ladies against the Junior Ladies soccer match. There were 3 other age group matches played. 05/03/2016 - Bernadine and Veronica went to the Marina Craft Market today. Veronica setting up the table at the Marina Craft Market. 29/02/2016 - The February Monthly Report by the Chairman. 25/02/2016 - Plenty going on at VHCC today. Sharon brought some colourful material today. What are all these bottles doing here? The sports teams are training. They need weights to make them stronger and fitter. So we made some. 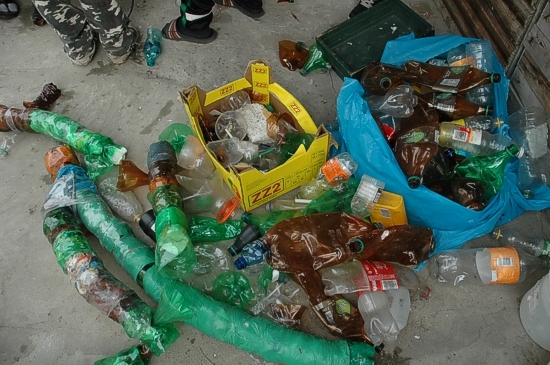 Reusing and Recycling bottles in the process. The lessons being taught here are learning about and taking care and responsibility for the natural environment next to our play ground. 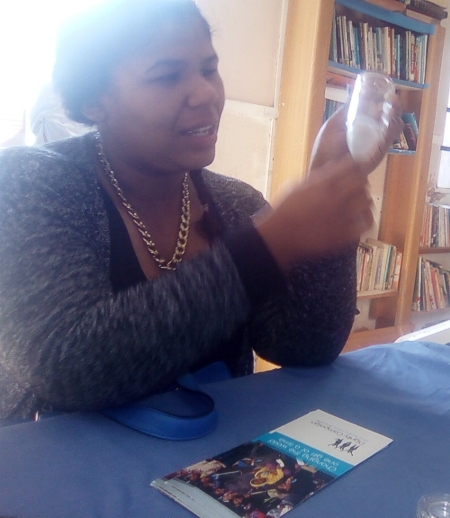 See the photos below for 23/02/2016 when the Environmental Resource Management interns came to visit. The weights all lined up neatly for todays practise. The work bench where the weights are still being made. The bottles are filled with sand. The small bottles are dumb bells for the girls and the younger children to use. 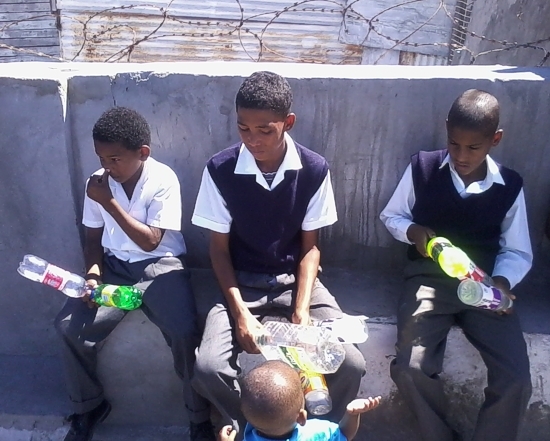 children who did not have any, they then searched the Nature Garden area to find suitable bottles. 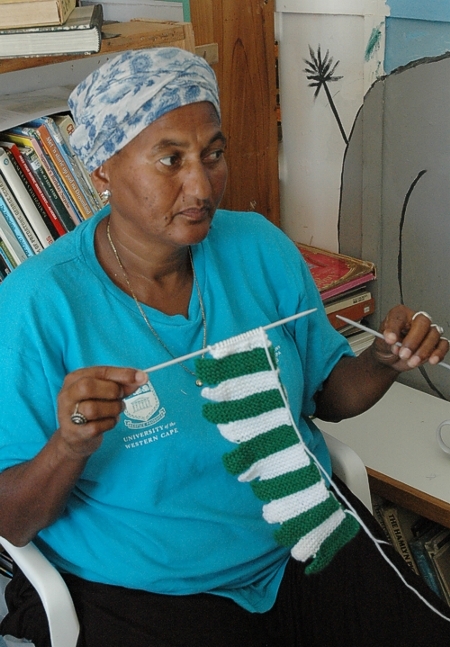 24/02/2016 - Joan's knitting classes have changed to Wednesdays. 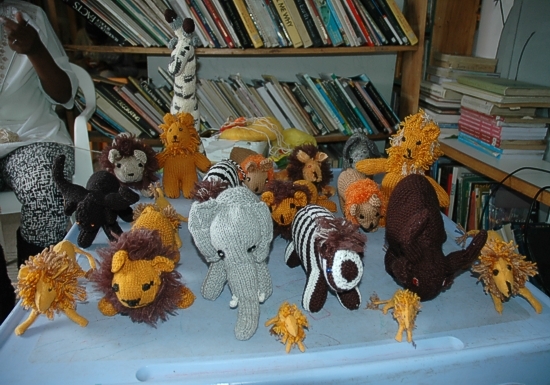 We are making lions now. 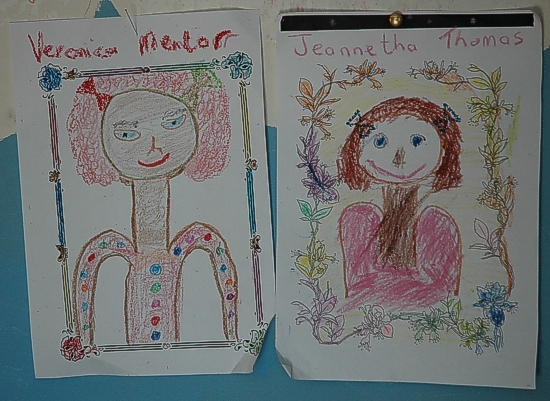 This is the sample made by Joan, next to a real cousin image in a library book. 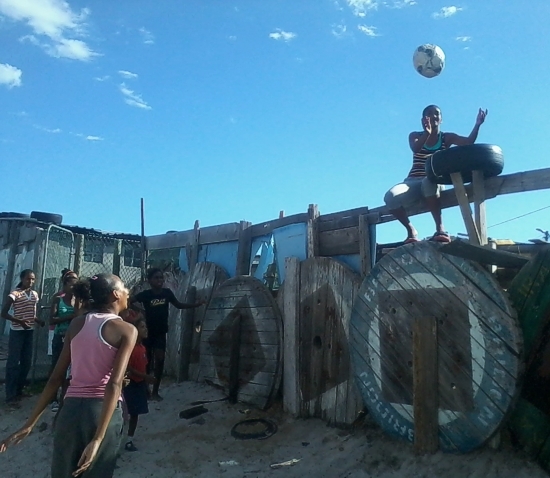 24/02/2016 - We have got a netball hoop made from a car tyre and some planks. 23/02/2016 - The Citys ERM interns Allie and Nicola came to visit today. Bernie could assess the needs. There is a plan. 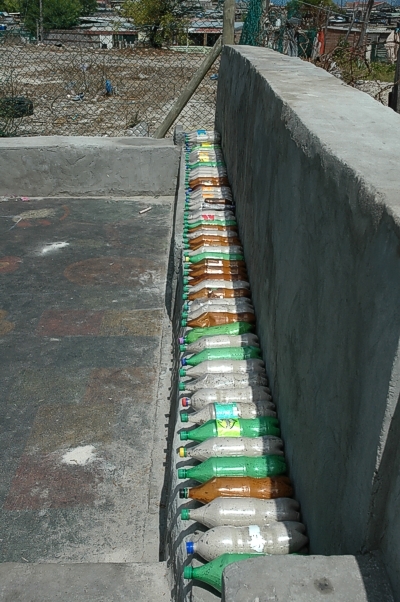 They have also brought empty plastic bottles for reuse in the sports training. 18/02/2016 - As usual there is plenty going on at VHCC. 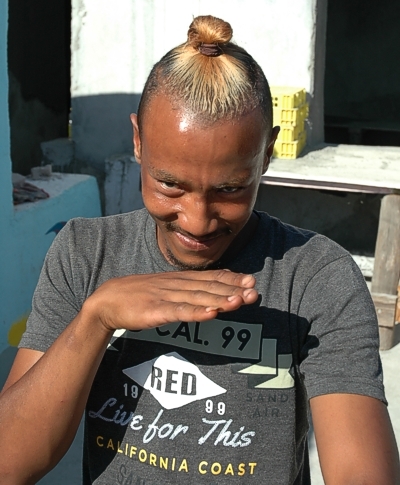 Ismail is sporting a new cool hairstyle. the lemon tree leaves. 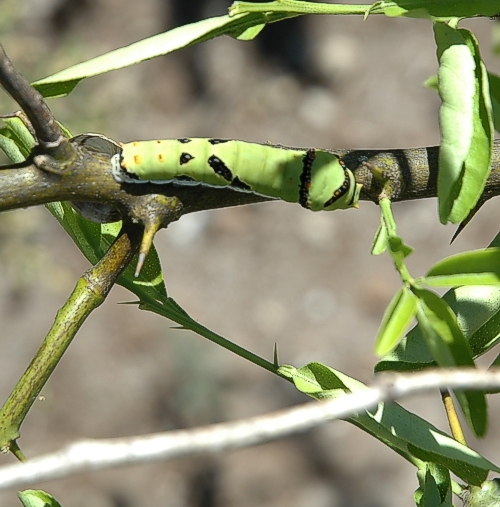 Citrus trees are the host plants for these larvae. 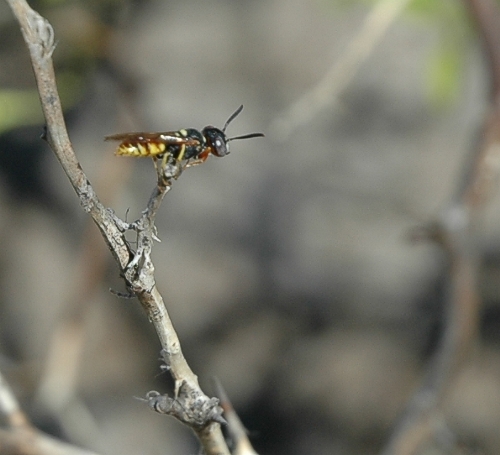 lay eggs for their pupae to feed on the live catepillars. 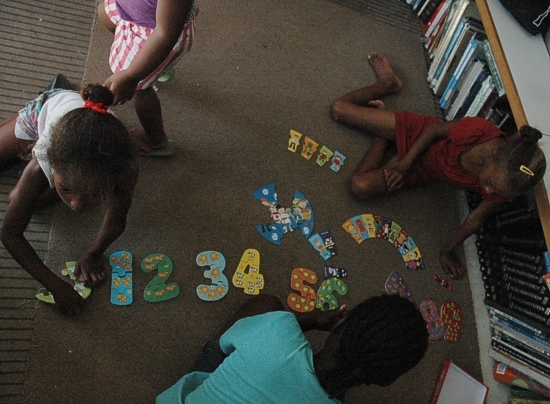 The little ones were putting a jigsaw puzzle together on the floor in the library. "We dont need help we can do it by our selves" they said. The knitting classes have changed to Wednesdays. This week we did coat hanger covers. The hangers all came from the recycling project down the road at Sonja's house. 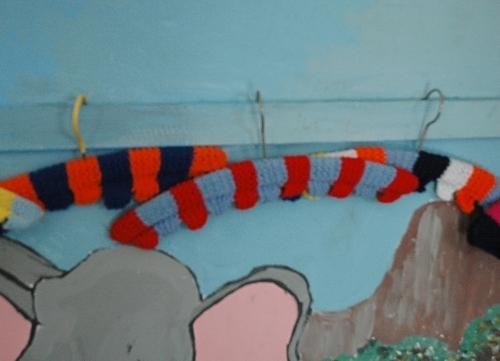 So our knitting project is also helping by reducing, reusing and recycling. Some multicoloured wool was tried. It has a crochet pansy flower too. 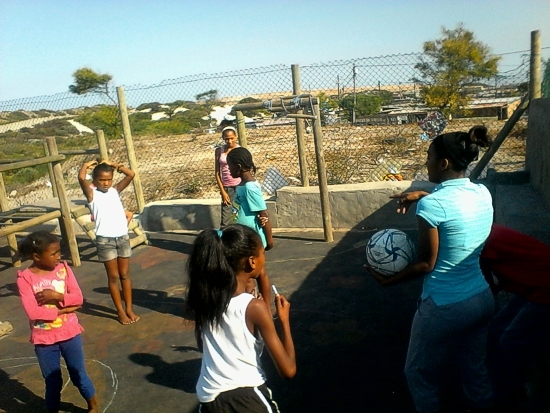 17/02/2016 - Netball practise took place today in the playpark. The senior players train the younger players after all school homework has been completed. We had a photographer today to record some of the fun and action. 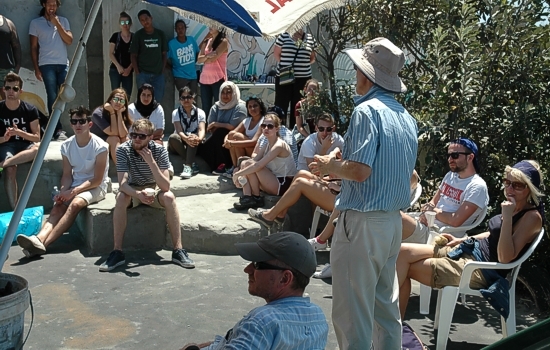 17/02/2016 - Bernie attended a Table Mountain Fund workshop at the Zandvlei Nature Reserve today. funding and we were able to ask all the questions about the possibilities for our funding applications. 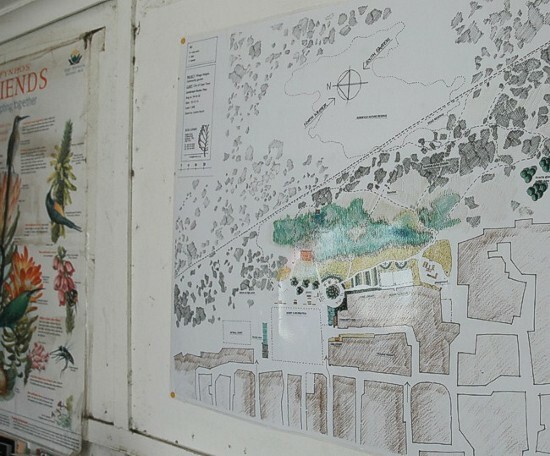 the processes in the EE Centre at the Zandvlei Nature Reserve. 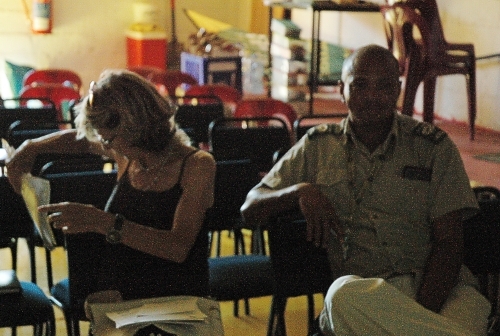 Sharon McCallum, Chairman of ZVT and Mark Arendse, Zandvlei Environmental Education Manager. 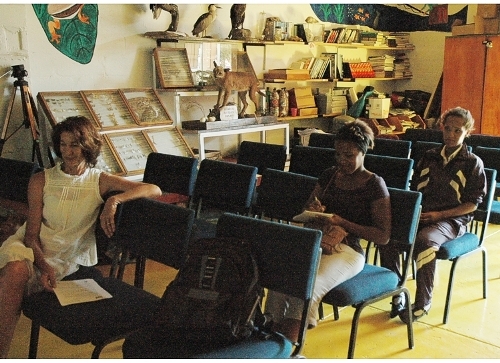 Cherry Giljam (Friends of Park Island at Zandvlei), Bernie and Edwina listening and making notes. was cancelled today, so the children played in the playpark instead. The soccer practise starts at 16h45 when all the homework is completed. to VHCC and these mermaids jumped in. finished before anyone can participate in afternoon fun activities at VHCC. 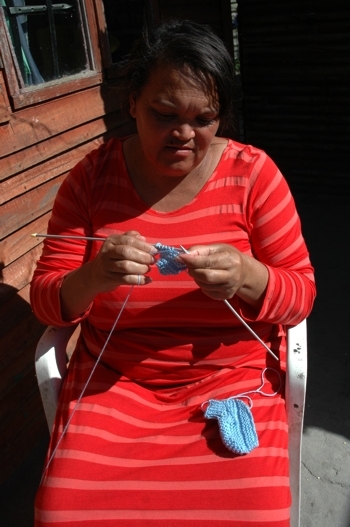 Veronica knitting a new batch of coat hanger covers. All the previous hangers have been sold. presented by Joan for the class today. These are a row of Easter ducks which were started today. 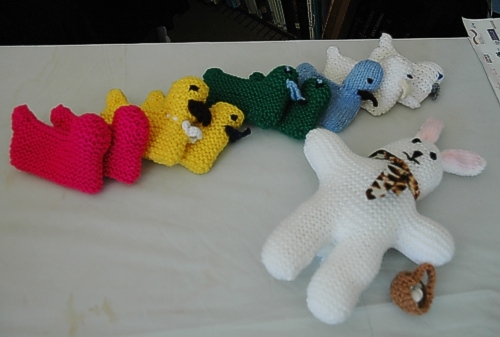 Some crocheted and the rest knitted. 06/02/2016 - The table which Bernie setup at the Marina da Gama Shopping Centre market. There was some mid oil burning with a lot of work put in to build the stock for the weekend. Bernie said the sales were very slow, possibly due to Elaines being closed. She did say she was kept entertained by the other stall holders with the banter going back and forth. 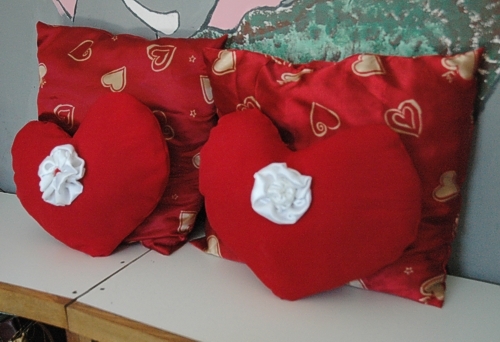 Valentine Day was the theme which is this coming weekend. 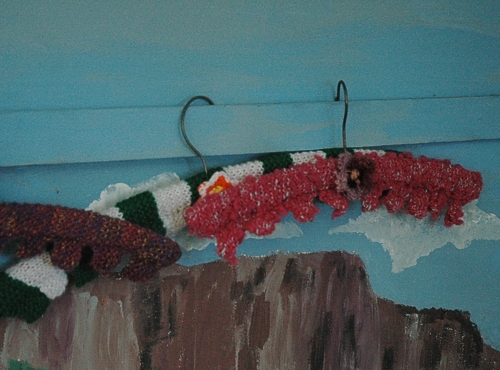 The coat hangers sold out with an order placed for more. 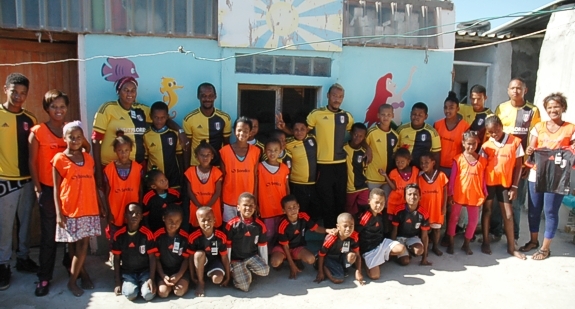 04/02/2016 - The teams photo with the tops worn by most of the members for the sports teams. This is part of the sports gear donated by the Kingston University team last week. The teams all together some were missing so the adults stood in for the photo. The orange bibs are the netball teams. The yellow tops are the senior soccer teams. The dark blue and red tops are the junior soccer players. Veronica with the front and back parts to the Valentine Day doll she is making. 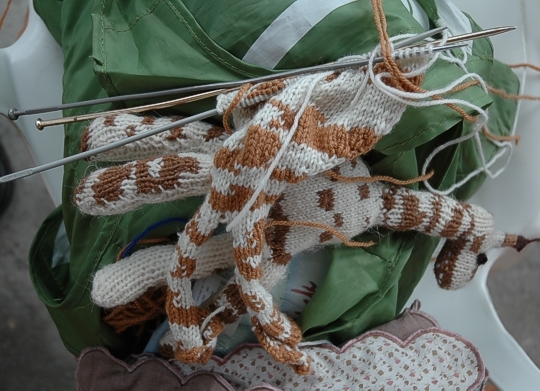 One of the dolls being sewn up. 31/01/2016 - The Monthly Report by the Chairman of VHCC. 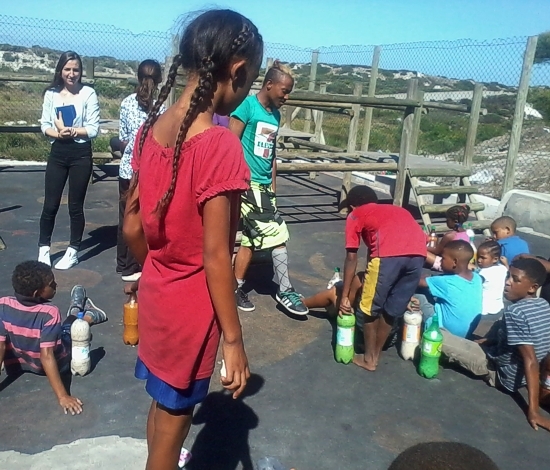 after participating in a litter cleanup in the Nature Garden area, and observing the recycling programme recently introduced at VH. to play and watch a game of football on the sports field. 21/01/2016 - There are some of the big five animals appearing in and around the Rondevlei Nature Reserve. Giraffes in light and dark shades. 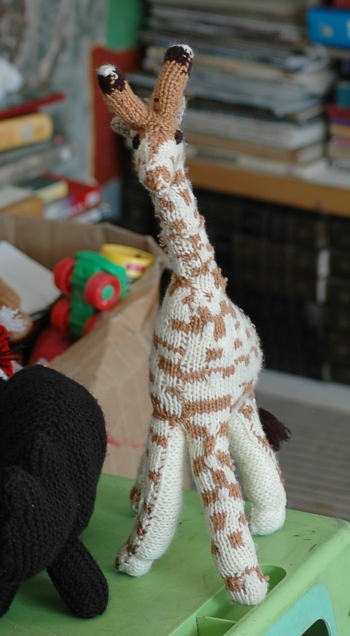 Veronica sewing the giraffe up just before the stuffing goes in. 14/01/2016 - Starting the new year. Bernie and Veronica picking green beans for supper. 07/01/2016 - Starting the new year. The tyre forest has survived the Christmas period so far, including the howling wind and heat. 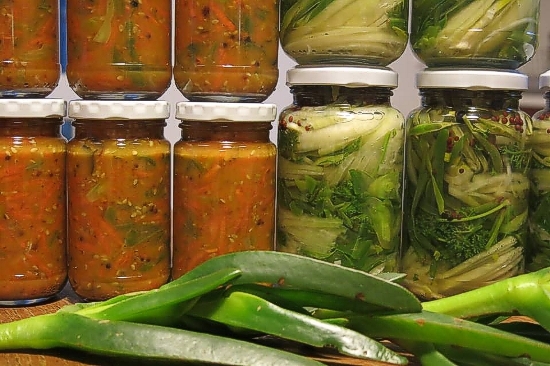 The VHCC vege garden has been producing a variety of things to eat. The area burnt on the 17/12/2015 has recovered quite well. See what happened at VHCC during. How you can help? 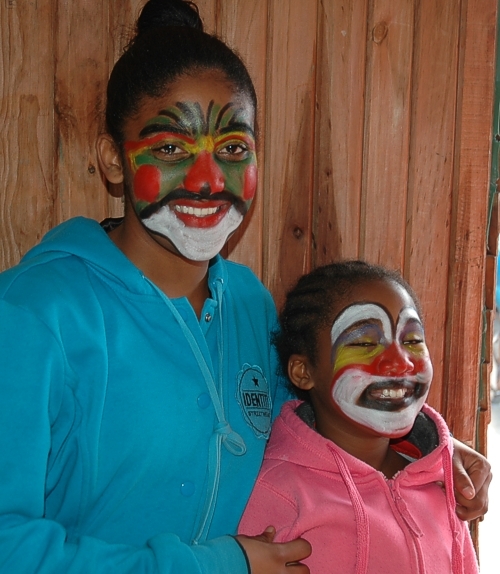 Zandvlei Trust is helping. 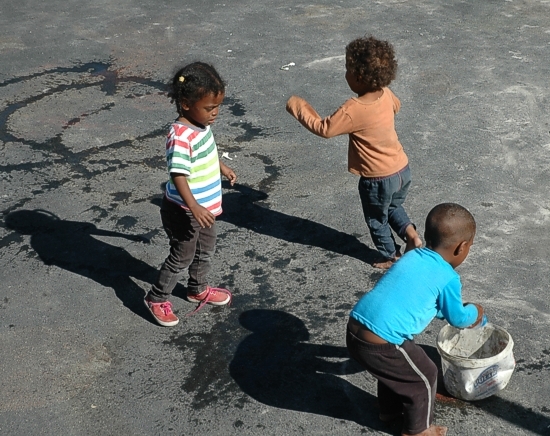 By donating money for transporting the children on educational and sport outings. 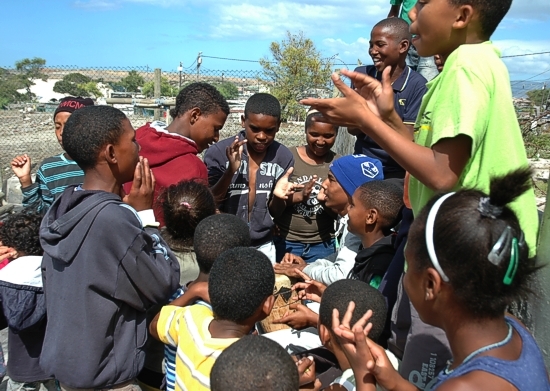 (eg Zandvlei Nature Reserve, to Rondevlei Nature Reserve, to Muizenberg beach to learn to surf). 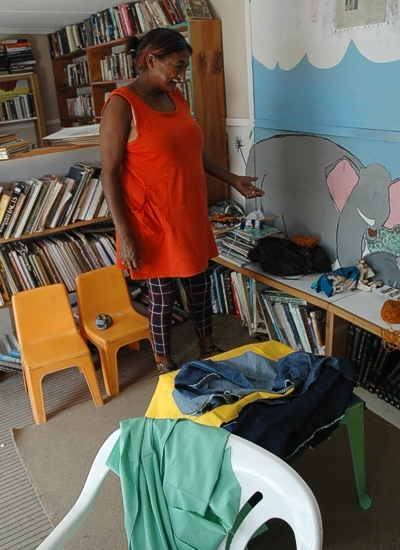 We need suitable library material (books, magazines, posters, paper, crayons, etc) for the creche and library. Various computer equipment and programmes are required. We need various seeds for the vegetable garden. Also gardening tools and implements. We need a football and soccer jerseys, shorts and boots. What skills training, education practise or help can you offer? or Gavin Lawson on 021 705 5224 if you need more information. Aug 2016 The Waffle House, Ramsgate. Donation 10/08/2016. July 2016 Patty Kolbe. Books and educational games for the library. April 2016 Patty Kolbe. Books for the library. Dec 2013 Una Hartley. PC equipment and furniture. Oct 2013 Barry Parker. PC equipment. March 2012 Gerrard Wigram. Skills training, accounts. 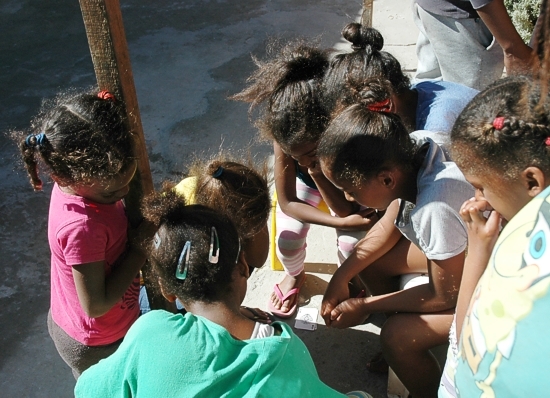 Skills training, communications, social services and development. Jan 2007 The Christ Church, Constantia. 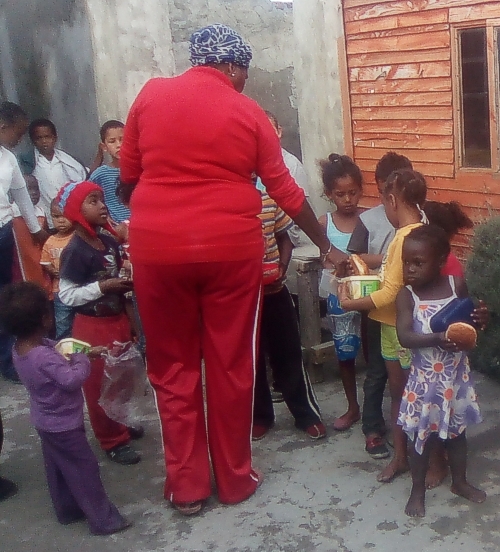 Food hampers and clothing.